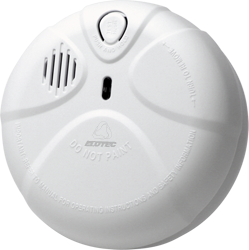 Connected smoke alarms have become commonplace, and ensure that everyone in the house is warned of a fire situation. But how do you locate the beginning fire when you are surrounded by squealing alarms? The EO 120 with Elotec's patented Fire Origin feature guides you directly to where the fire is, through one simple press on any smoke alarm in the system. Many cheap smoke alarms use the 433 MHz frequency band, which is open to all kinds of equipment - from garage door openers to radio controlled toys. EO 120 uses the reserved alarm frequency of 868 MHz, which provides communication without interference and with maximum safety. 15 separate channels enables the EO 120 to be installed in several apartments in the same building / neighborhood without affecting each other. An easily configurable booster feature provides increased range where necessary. The EO 120 comes complete with a battery with an expected lifespan of 8 years!